Quietside Hosts Grand Reopening in Carlisle PA.
Quietside hosted a dedication ceremony, lunch and open house on May 26th. This day was the formal opening of the first addition to the Carlisle property, adding another 25,000 sq. ft. to the building. Mr. 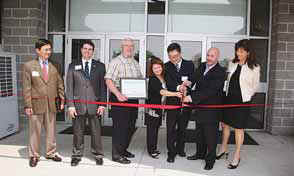 Sang Lee, Quietside’s president opened and dedicated the extension. John Miles is Vice President. Mr. Sang W Lee announced in October of 2010 that “due to the success of our business in the Northeast of the US as well as Canada we must position Carlisle for our growth for years to come.” Quietside began a substantial addition and renovation of the PA facility in October 2010. The addition of 25,300 sq. ft. of warehouse space and renovation / addition of office space began late October. During this renovation Quietside also began the installation of a Samsung DVM, variable refrigerant flow system for peak HVAC efficiency while also replacing every light fixture on the 7.5 acre property. The finished product is a state of the art 85,000 sq. ft. training and distribution center. Quietside Corporation was founded in 1998. The Company is a master distributor of niche products for the HVAC industry. They have developed relationships with Korean and Chinese manufactures to import, and distribute high efficient Air Conditioning, Heating and Water Heating products. With three distribution and training centers in North America, Quietside has proved to be a successful player in offering mini split HVAC systems, 90%+ water heating systems. Positioned with facilities in Santa Fe Springs, CA. Fort Worth, TX and Carlisle, PA, Quietside supports all sales, warranty and technical training. As the company grew in the early part of the century Quietside looked to open a warehouse and offices in the North East of the US. They eventually settled on Carlisle PA and in January of 2003 Quietside opened their 60,000 sq. ft. distribution, offices and training center. Jack Ernest relocated to Carlisle to spearhead their efforts in building the operations at this location, including recruiting the majority of the team that they currently have in place. Thanks to the hard work of Jack and all of the Quietside employees, Quietside has grown, hosting almost 2,000 visitors for technical and sales training over the last eight years. The Carlisle branch has successfully grown from 11 full time employees to 15 and plan to add more.